The other day we all talked about our Favorite Cozy Mystery Themes, which got me thinking of a comment that MJ posted quite a while back. 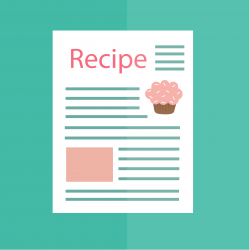 … a possible future idea for a post on this blog: What is your favorite recipe you’ve made from a cozy mystery? With so many of us liking the culinary/cooking/recipes Cozies, do any of us try the recipes the authors include in their books? I know I don’t >>> but that’s because I don’t like to cook/bake. Even though I have never tried one of the recipes, I read through them all. That’s right! I read through the recipes, perhaps thinking I will one day cook/bake them. All of this got me wondering: Have you ever tried a recipes from a Cozy Mystery? Do you try out the Cozy Mystery recipes on a regular basis? Have you tried a recipe that turned out to be fabulous? If so, would you mind telling the rest of us about it, and please be sure to include the author’s name and the book it came from. P.S. Thanks, MJ, for a great entry idea! I hope to see lots of favorite Cozy Mystery book recipes >>> and perhaps I’ll finally try one! Also, here’s the Mysteries with Recipes AND Recipe Books by Mystery Authors theme if you want to take a look at it. The first mystery with recipes I read was The Baked Bean Supper Murders by Virginia Rich. This is a great recipe for baked beans from the book. Cover beans with water, bring to a boil and set aside for an hour. Drain, add fresh water, simmer until just tender. Drain, reserving bean liqour. Put whole onion and half salt pork in a large bean pot. Mix syrup, mustard and salt with hot liquor to cover beans, top with remaining salt pork. Cover, bake 6-8 hours at 275 degrees, adding bean liquor as needed to cover beans. Uncover, top with cream last hour. Cindy, these beans look delicious! Thank you for sharing the recipe with us. I agree that this is a great recipe! From “Bookplate Special” by Lorna Barrett~~~Bob’s Special Meatloaf. It has become our family favorite. I use less onion than the recipe calls for, other than that it’s just wonderful. I have two favorite recipes from cozy mysteries! The first is one I have made several times – Miss Beachum’s Raisin Bread from the book AUNT DIMITY AND THE NEXT OF KIN by Nancy Atherton. The other recipe is called Frijoles de Olla (Beans in a Pot) found at the beginning of chapter seventeen of INDIGO DYING by Susan Wittig Albert. I just call it black bean soup. I love the flavor of this soup and it is so pretty when served that it would be perfect for a small gathering or having a special friend over on a winter day. When serving, each bowl is garnished with sour cream and chopped cilantro, tomato, green onion, or jalapeno pepper. Sprinkle with grated cheese. The colors and flavor are wonderful. I use everything except the jalapeno for the topping when I make it. The recipe calls for epazote which I did not have the first time I made it, so I later grew my own. But I have since purchased it at Penzeys Spices. The black beans have to soak overnight before starting the recipe, but with cumin, garlic, oregano, and onion, the flavor is worth the time. These are both recipes I keep handy and ready to make again! Yes! I have tried several recipes and the one that we make over and over is Florabelle’s Soda Bread from “The Darling Dahlia’s and the Cucumber Tree” by Susan Albert Wittig. Love the series AND the bread. Enjoy. Sharon, thanks for recommending Florabelle’s Soda Bread. I just Googled soda bread, and it looks like exactly what we would love! The Cappuccino Royale cookies from Joanne Fluke’s Key Lime Pie murder. I also have done several of the dessert recipes from Joanne Fluke books. All have been delicious. Jane & Ana, since I’m a fan of Joanne Fluke’s Cozies, I end up reading all of the recipes. I am going to start to think more seriously about trying the ones that look yum-a-licious to me, which are most of them! My favorite recipe would be the Blueberry Crunch cookies from Joanne Fluke. (I forget which book I took it out of). I have also enjoyed various scone recipes from Laura Childs’ tea series. Cindy, I’m going to have to (possibly!) start trying the recipes in some of my favorite authors’ Cozies! I can’t believe I never have tried one! Wow — who knew??? I’ve never tried any recipes from any cozies — I didn’t know anyone really does! Haven’t got anything to add, but want to follow the comments & see what everyone else has to say! Margaret, I, too, was a little surprised to see how many people make the recipes. However, I think I’ll probably try some of these that other Cozy Mystery readers have been recommending. I’ve tried many of the recipes from the cozies I have read. Two of my go-to recipes are from the Cackleberry Club series by Laura Child. The recipes have gotten separated from the books over the years, so not sure which books they came from, but they are Blueberry Breakfast Squares and Brown Sugar Meatloaf. I always save all of the recipes from this series, as well as the Domestic Diva series by Krista Davis. I even write down the food she prepares throughout the book. Sophie can walk into her kitchen at any given time and whip up a feast for her house guests at a moment’s notice. I always wish I was in her kitchen! Susan MT, what a great idea it is for you to save all of the recipes from these two authors. Even if you get the books at the library, you’re able to copy them right when you take them back. Before I finish the first chapter of a ‘food’ cozy, I check out the recipes. For example. I’m currently reading, ‘Fudging the Books’ and looked quickly at the recipes………hmmm, ‘Bailey’s Irish Cream Pie’ sounds decadent. The latest Childs’ scrapbook release has several tasty looking goodies, such as ‘Pecan Pie Mini Muffins’, ‘Caramel Shortbread Bars’, and ‘Old English Crumb Cake’. What bothers me is when someone in the story is preparing a dish that appears really delectable. Then I look for the recipe and there isn’t one! Gerber does this in ‘Fudging the Books’, as do MANY other authors. Bummer! Joanne Fluke practically writes a cookbook with each new cozy. I’ve tried many of her recipes and have never been disappointed. However, she has a tendency to over-explain the procedures, thus making the recipes appear very long and intimidating. I usually condense them into a more normal format. The recipe I chose to share is the one I probably make the most. In one of the books (can’t remember which one) Hannah’s sister (I think) prepared this for a funeral dinner. Our church also serves funeral dinners. I called the lady who is in charge of this ministry and asked if I could bring this dish to the next funeral dinner! I’ve made it many times for family/friends. It’s also a good pot luck item and a nice addition to the holiday table. It’s also a ‘make ahead’ food item, preferably the day before. As is normal for me, I create ‘variations’, which I noted at the end of the recipe. Drain can of crushed pineapple. Save liquid. Boil 2 cups water in small saucepan. Remove from heat. Add jello to boiling water and stir (about 3 minutes) until jello is dissolved. *Combine the juice/liquid from the canned pineapple to cold water to make 2 cups of liquid. Then stir into jello mixture. Refrigerate until jello is partially set (approximately 45 minutes). Put jello mixture into bowl and whip with a whisk. Fold in cool whip. Fold in lemon pie filling. Then fold in the drained crushed pineapple and blend thoroughly. Transfer to serving dish and refrigerate at least 12 hours. ** A 3.2/3.4 oz. pkg. of instant lemon pudding and pie filling can be used instead. Follow directions to make pie filling and then add it to jello mixture at the right time. NOTE: Jello makes a ‘Strawberry Crème’ pudding (dry – 3+ oz. pkg.) available only at Walmart. I make this pudding and use it with strawberry jello (instead of lemon) and sliced strawberries instead of pineapple. Although, pineapple could still be used in combination with the strawberry flavored jello and pudding. A few months ago, I found peach pudding (again in a dry pkg.) made by Royal. I made this and combined it with peach jello and sliced peaches. Lucky (brand name) makes a ‘Key Lime’ canned pudding. Although I haven’t tried it, I think it would make an interesting combination with lime jello. I probably would still use the crushed pineapple in this combination. If making during the Christmas holiday using a ‘red’ fruit such as Maraschino cherries (strawberries, or raspberries) would look festive. I enjoy many recipes in the various cozies I read — way too numerous to list here. But I want to mention the Donut Muffins in one of Coyle’s books. They’re fairly basic, yet yummy. MJ, you’re right about her recipes looking long and drawn out. That may be why I have never actually tried one after reading through it, even though they look really scrumptious. Also, I discovered that Nestlé makes both a pumpkin spice chips as well as their normal baking chips that are both orange and chocolate-colored. I went to our local grocery store and was so excited to see that I was able to find the chips for your “MJ’s Double Pumpkin Layer Bars” but when I came home and looked at your recipe again, I saw that I had bought the wrong kind of chips. Not to worry, though, since they are now in my freezer and are absolutely ideal for a small, sweet snack every once in a while! Anyway, I found the correct pumpkin spice chips at Walmart, and plan to make them this weekend. Yum-a-licious! Just a note on the Double Pumpkin Bars (from a previous post). The recipe may take more than 20 pumpkin oreos – perhaps 25 or so. Just make sure there is enough to cover the bottom of the 9×13-in. pan. Or, you could use an 11×7-in. pan. Everyone I know that has tasted them so far has said they are delish! MJ, thanks, again for the “MJ’s Double Pumpkin Layer Bars” recipe. I have all of the ingredients ready to bake tomorrow. (If I make a sweet dessert, it’s usually on Sundays.) I have just changed the 20 to 25. These would be crazy-easy to do for Christmas with Christmas time special ingredients. Great topic!! I’ve tried a few recipes. My favorite: Pecan-crusted pork tenderloin with orange-maple glaze from Julie Hyzy’s All the President’s Menus. It is so yummy!! Linda MH, pecan-crusted pork tenderloin sounds really yummy, even without the orange-maple glaze. Pina Colada Muffins from Sweet Revenge by Diane Mott Davidson and Ursula’s Rum Cake from The Body in the Gazebo by Katherine Hall Page are two favorites. Cynthia, thanks for telling us about these two recipes. I’m going to have to take a look at them (again!). I have always been sort of intimidated by Diane Mott Davidson’s recipes. They seem like they are truly caterer-quality. Does anyone of have hashbrown recipe from Julie Hyzy’s first White House Chef book? I have lost it! Place olive oil in a large nonstick skillet over medium heat. Mix remaining ingredients in a large bowl. Place grated potato mixture in a potato ricer and squeeze any excess water out of the potatoes. (This makes them crispy.) If you don’t have a ricer, place the grated potatoes between sheets of paper towels and press to remove excess moisture. When oil is heated to a simmer, pour potato mixture into skillet and mash it down to a thinnish pancake using a spatula. Cook until bottom layer is browned and crispy, about 4 minutes. Turn over and cook other side until browned and crispy, about 3 minutes. Place onto warmed plate or platter and serve garnished with sprigs of fresh thyme and chives tied together with a knotted chive leaf, if desired. The blueberry muffins from Katherine Hall Page’s The Body in the Lighthouse are delicious! Preheat the oven to 400. Butter 18-24 muffin tins, or use paper liners. Lightly beat the eggs, milk and melted butter together. Add this to the dry ingredients and mix. Fold the blueberries into the batter and fill each cup in the muffin tin completely (not ¾ full). Randi, thanks for posting this recipe. These blueberry muffins look delicious >>> and not at all complicated to make. Once my book club chose to read culinary mysteries. Everyone chose a different book and when we met to discuss them we each brought a dish to pass made from one of the recipes in the book we chose. Our favorite was a mexican dip recipe from the Goldy Schulz mysteries. I can’t remember the exact recipe. But Diane Mott Davidson did just release a cookbook that includes tidbits about writing the Goldy Schulz mysteries and more. CuppaCozy, what a very nice book club!